We wonder if Shah Rukh Khan and son Abram Khan really got into trouble for not agreeing with mom or as SRK’s post and little munchkin’s T-shirt read. In a recent picture that the Zero star updated on his social media account, Shah Rukh Khan is seen lazying on a couch at Mannat with his youngest son and both donned comfy casual outfits. While Shah Rukh lazied in a dark blue T-shirt, paired with black coloured shorts and glasses hanging from the neck of his T-shirt, dandy Abram lay next to him in a peach-coloured T-shirt with a quote in blue that read “I know I’m in trouble…” and teamed it with blue printed shorts. 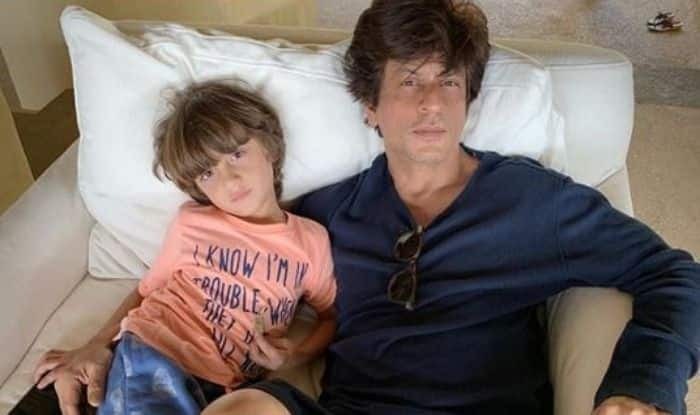 Giving fans sheer lazy Sunday vibes with their relaxed expressions and messy hair, the father-son-duo took their camaraderie to another tangent with this picture which Shah Rukh captioned as, “Weekend Research: “ A survey has found One in Three men are just as lazy as the other Two”. We r the other two and we don’t agree mom!” (sic). Recently, the charming actor of Bollywood left his fans wooed as his wife Gauri Khan and daughter Suhana Khan were seen showering him with kisses on the pretext that he deserved it most of the days and we completely agree. The picture was shared by Gauri and looked totally adorable. From pulling each other’s legs to not shying away from showing their affection for each other on social media, Shah Rukh and Gauri have been one of the most loved couples of Bollywood. The two tied the knot in 1991 and post that he made his big Bollywood debut with Deewana (1992).